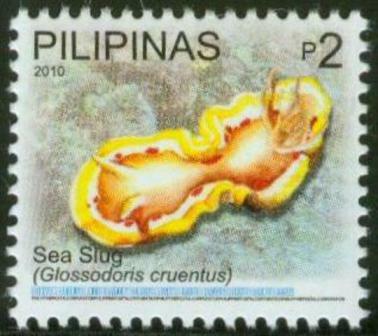 The Philippines forms an ocean region that has long been recognized as the world’s center of marine biodiversity. With the Malay archipelago, Papua New Guinea and Australia, the country forms the ‘Coral Triangle,’ so-called because of the abundance of its coral reef life. Some 400-500 species in 90 genera of reef-forming corals are believed to exist in this region. Sulu-Sulawesi Sea, a 900,000-square-kilometer marine eco-region that lies at the apex of the Coral Triangle (70% in the Philippines, 20% Indonesia, 10% Malaysia), is home to some 2,500 species of fish. The Philippine center of diversity was found to have the highest species richness for all distributions combined as well as when shore fish distributions were treated separately. 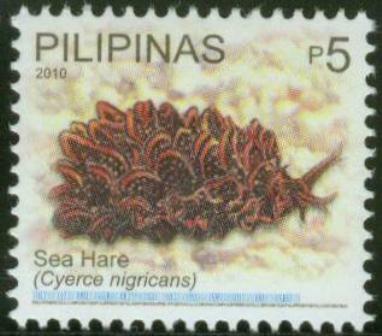 5p SEA HARE (CYERCE NIGRICANS) is a species of sacoglossan sea slug, a shell-less marine opisthobranch gastropod mollusk in the family Caliphyllidae.